Date: Mar 8 2019, 8 a.m. - 4 p.m. Seating begins at 7:30 a.m.
Stop by for the Family Advocacy Workshop! 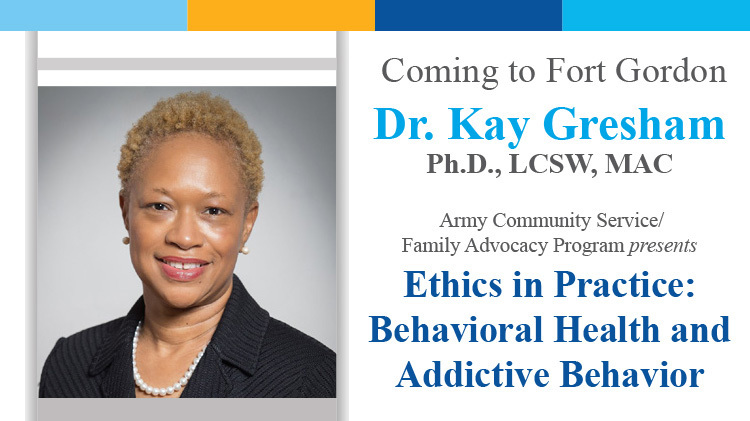 The topic to be covered is "Ethics in Practice: Behavioral Health and Addictive Behavior". This workshop is only open to Fort Gordon military members or DoD ID card holders to include active duty, reserves, retirees, family members and DoD civilians. The workshop will provide professional education via a presenter and Continuing Education Units (CEUs) via the National Association of Social Workers-GA (5 ethics hours and 1 core hour of CEUs). Registrants must complete the entire workshop to receive CEUs. Certificates of completion will be provided. Registration closes March 6th. Lunch and child care WILL NOT be provided, so be sure to plan ahead!